Could it be that it lost it’s popularity in just one generation? The cake that was one of our mother’s “no fail, absolute go-to” recipes? 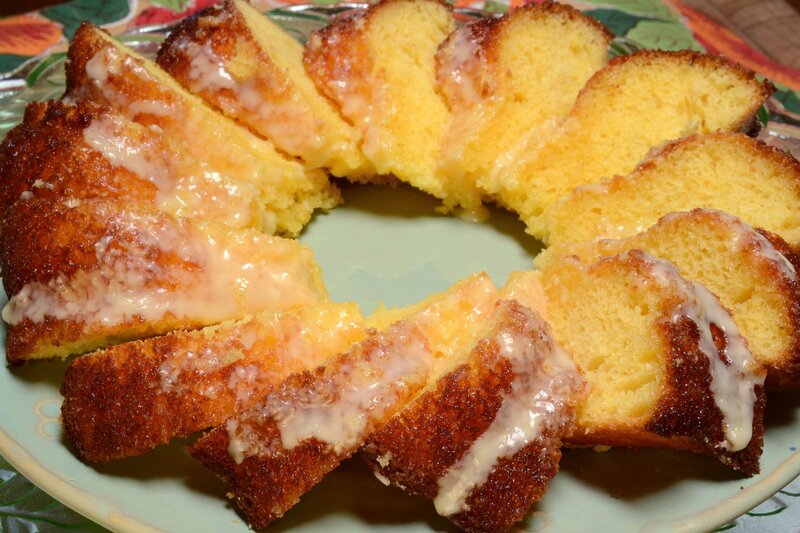 The brilliant yellow moist miracle in a bundt pan? I presented a group of millennials (you know, those 20-30 somethings!) with a certain rich and flavorful cake this week. While they all gobbled it up in short order, they had never even heard of the classic Harvey Wallbanger Cake. It had been years since I’d thought of this delightful treat myself – and what a shame, because it’s so easy to make! The Harvey Wallbanger Cake grabs it’s rich flavor from the vodka, Galliano liqueur, and orange juice that you find in the classic Harvey Wallbanger cocktail. Add some eggs, cake mix, and pudding, and this special treat backs up like a brilliant yellow sunflower, and absolutely melts in your mouth. A little sprinkling of powdered sugar, or better yet, a drizzle of glaze, and that’s all you need to relive the kitchen memories from the 60’s and 70’s. I was just a little girl when my momma started giving the Harvey Wallbanger Cake equal time with her classic Italian rum cakes. I remember the giant, long, thin bottle coming out of the cabinet. My father was the bartender at our restaurant, and so his beverage suppliers would, during the holidays, gift him with the extra, extra giant bottle of the liqueur. Back then, from where I was standing, I estimated that bottle to be 500 feet tall and not an inch less! I remember that the flavor of the cake (whenever I could sneak some) was just as large. Who knows, perhaps, with the resurgence in the popularity of classic cocktails like the Side Car, Manhattan, and Dirty Martini, the Harvey Wallbanger and it’s companion cake will find it’s sweet spot once again! Preheat oven to 350ºF. Grease one large bundt pan (9-10") or two small bundt pans (7-8"). In a mixing bowl, combine the cake mix, pudding, vegetable oil, eggs, vodka, Galliano, and orange juice. Mix until well blended, about 3-4 minutes. Pour into a bundt pan. Bake for about 45 minutes for the large pan, or 25-30 minutes for the smaller pans, or until a toothpick comes up clean. Let the cake cool, then mix together the ingredients for the glaze. If you don't want to glaze the cake, you can dust the cake with powdered sugar instead.